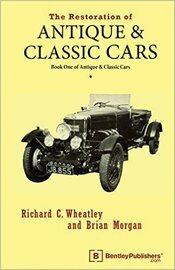 The purpose of this comprehensive book is to enable the amateur to restore their car to its original or "Show Model" condition. The reader is advised on the choice of a car to restore, its dismantling, the treatment of the frame, suspension, steering, axles, brakes and wheels, and on the rebuilding of the engine and gear box. It also includes chapters with information about the fuel system, controls and instruments, electrical equipment and wiring, the body frame and covering, body painting, coach trimming, special finishes and the garage and workshop.